Two guys, one obsession. That’s the story of Shelby Brothers Ltd. in a nutshell. We, Patrick and Marcus, bonded over our love for the most amazing TV show ever, and all things vintage like tweed suits, leather bags and cool undercuts. 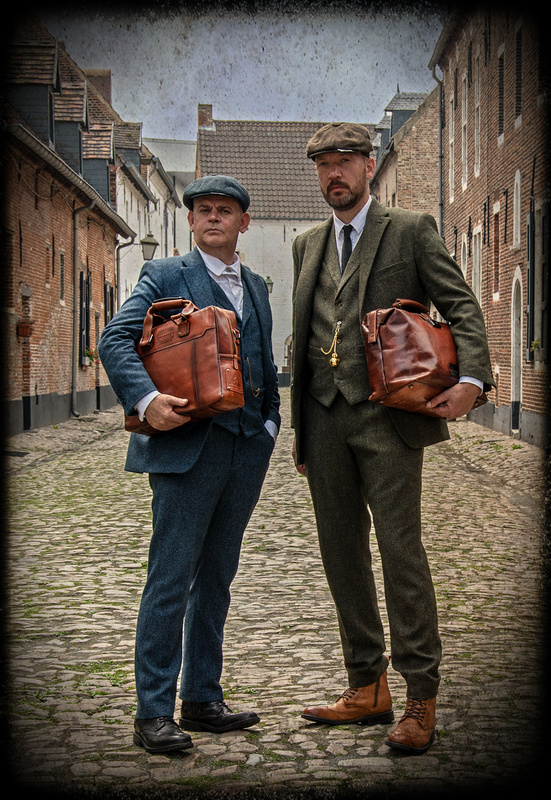 After endless discussions about favourite characters (Alfie for Marcus, John for Patrick but eventually agreeing on Thomas), while enjoying a few pints, a plan was born: we were going to create the greatest and coolest Peaky Blinders inspired collection of hats, suits, bags and boots ever. And so we did. Our main goal was to respect the show’s quality and amazing eye for detail. Our webshop should only include products that could match the fantastic costumes and accessories shown in Peaky Blinders. By using fabrics and leather of the greatest quality and setting up collaborations with renowned tailors and shoe and bag manufacturers, we’ve come up with a collection that will make every Peaky Blinders fan’s heart skip a beat. All products have been carefully designed and manufactured with 1920’s Birmingham in mind and have an authentic vintage look. Each item is created with much love and care and will last for years, as it should. This is our tribute to Peaky Blinders. We hope you enjoy it as much as we do.